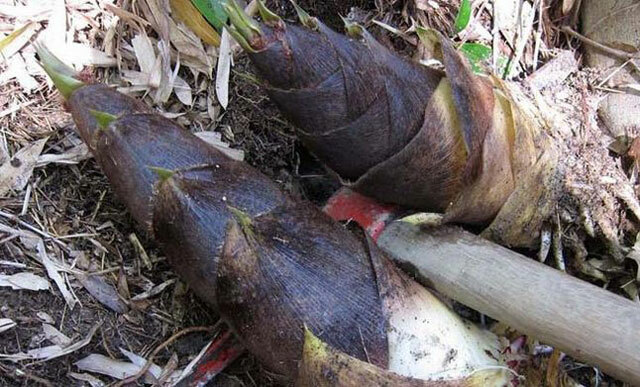 This time we will see the health benefits of bamboo shoot that many people don’t know. Bamboo shoot is a part of bamboo that can be eaten. Newly grown shoots on the ground have a soft texture and good to eat, even have health benefits. Shoots are delicious if eaten when still small and has not possessed 2 feet in high. Its a bamboo plant that enters the family of grass and includes the largest and highest grass in the world. Bamboo is the most useful plant, almost all parts can be utilized. The bamboo stems used for various purposes of handicrafts and even home manufacture. While bamboo leaves have great benefits for health. Please read on our article about bamboo leaves benefits. Consumption of bamboo shoots served in various recipes. Countries which is consuming bamboo shoots are China, Indonesia, Korea, Japan, India, Philippines, Nepal and Thailand. In history, bamboo shoots have long been used as a beneficial food by china people, this has been noted since the Ming dynasty came to power. Not only that, in Chinese history, bamboo shoot is considered as king vegetables with various health benefits. From the nutrition table above, we know that bamboo shoots are rich in benefits. Here we see more detail the usefulness and health benefits of bamboo shoot. As a food that rich in fiber, bamboo shoots play an important role in maintaining bad cholesterol levels and trying to lower the level of bad cholesterol up to normal limits. There have been studies that reveal that bamboo plant shoot is a healthy food that is useful for lowering bad cholesterol levels in the blood. Bamboo shoots include vegetables rich in fiber and low in calories and fat. So, this vegetable is good to help your diet program. High fiber content makes you full quickly. In addition, it’s can maintain the stomach from often hungry. This is the best opportunity for those of you who want to quickly lose weight. Bamboo is a vegetable that is high in content of phytonutrients, a compound that is useful for maintaining heart health. A study showed that phytosterol and fitonutrien in bamboo shoots could inhibit the bad cholesterol that dissolves in the body. In addition, bamboo shoots also contain potassium which helps keep the heart deacon always in a normal state. Beside keep heart health, the health benefit of bamboo shoot is prevent and fight cancer cells. Phytonutrients in bamboo acts as a powerful antioxidant that can prevent oxidative stress due to free radicals. Free radicals can cause cell damage and create abnormal cells (cancer cells). Besides phytonutrients, bamboo shoots also contain chlorophyll which is useful to prevent cell mutations. Consuming bamboo shoots also beneficial to get rid of constipation. Bamboo shoots are rich in fiber that is good for keeping the mass of the stool so easy for the intestine to move the stool and remove it from the body. If you have this digestive problem, immediately look for bamboo shoots in the vegetable market and consume regularly. In addition to containing phytonutrients, bamboo shoots also contain anti-inflammatory that are useful for curing diseases caused by viral, bacterial and other infections. For arthritis sufferers it is also very good to consume bamboo shoots to reduce inflammation. Thanks to anti-inflammatory content, bamboo shoot is well used as a food to cure respiratory diseases, especially those that appear in upper respiration. 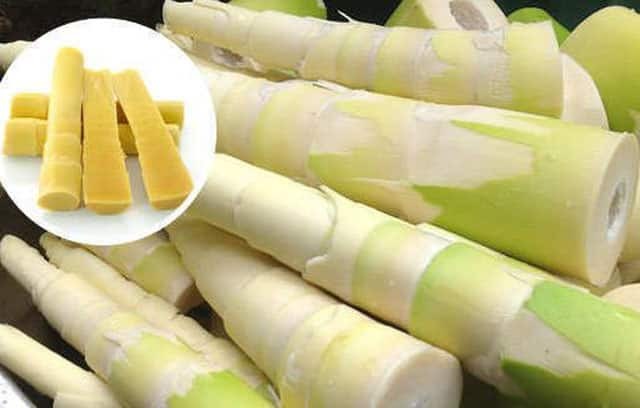 In addition to the benefits of bamboo shoots, boiled water is also good for treating some diseases such as cough and sore throat, but for a satisfactory result, add a little honey in boiled water of bamboo shoots. Bamboo shoots contain many nutrients such as vitamins, minerals, and antioxidants. Thus, the health benefits of bamboo shoot for health also good in boosting immune system. Talking about digestion of course a very good food is fibrous content foods. Bamboo shoot are high dietary fiber vegetables that are good for the health of the inside of the stomach. So, to prevent constipation and other digestive problems, bamboo plant shoot is the solution. Insoluble fiber in bamboo shoots helps the movement of the intestine so that the food is easily digested and the disposal of feces is also easy. Urinary tract infections are caused by microorganisms such as bacteria, fungi and viruses. One way to treat it is to consume bamboo shoots. Anti-inflammatory and antioxidant properties in bamboo shoots help kill bacteria that infect the urinary tract. Beside that, health benefits of bamboo shoot is lowering high blood pressure. All of these are thanks to the fiber and potassium within. In addition, the benefits of potassium is to maintain the stability of blood pressure so that no pressure spikes occur. In Chinese medicine, bamboo shoot is known as vegetables that are uterotonic that stimulate uterine contraction. A study conducted by Gruber and O’Brien from the University of Vienna says that bamboo shoots is one of the plants that are uterotonic among thousand other plants. That is why in ancient Chinese medicine they often use bamboo shoot for pregnant women who are late in delivering. As we have mentioned above, that bamboo shoot is useful to reduce cholesterol so that the accumulation of cholesterol in the blood vessels can be avoided. High cholesterol in the blood can trigger atherosclerosis or arterial thickening, the leading cause of heart disease. In addition to antioxidants and anti-inflammation, the shoot also contain vitamin E which is good for skin health. Vitamin E also acts as an antioxidant that works to prevent free radicals on the skin. This will delay premature aging and make you look younger. Health benefits of bamboo shoot also gain by those with diabetes or blood sugar. Fiber in bamboo shoot prevents the absorption of sugar into the blood. So, you can eat safely because it does not experience a spike in blood sugar after lunch. Beside good for lower blood sugar, Bamboo shoots contain anti-fungal, effective use to treat skin diseases caused by fungal attack. While anti-inflammatory content helps cure fungal diseases quickly. Anemia is a symptom of red blood cell deficiency that causes oxygen to pass through the body. Bamboo shoots are rich in iron, the builder of red blood cells that is also found in large quantities in sweet potato leaves. Bamboo also contains painkillers or analgesic. Thus the results of research conducted by Muniappan and Sundararaj. So, consuming bamboo shoots can soothe the stomach and help the healing of peptic ulcers. Health Benefits of bamboo shoot also maintain the body’s metabolism. The content of manganese contribute to the formation of metabolic enzymes so as to maintain overall body health. Consuming bamboo shoots can purify the blood from toxins so good for animals that are food poisoning. In the life of the ancient Indians, bamboo shoot extracts were used to treat a person who was bitten into a squeak or snake. Bamboo shoots also contain calcium that provides a supply of substances for bone health. Consuming bamboo shoots can keep bone density and prevent bone loss.